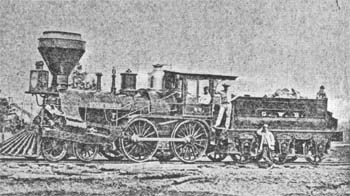 The first locomotive to reach Paisley, arrived here June 7, 1872, and passenger service began on August 28th of the same year, With the establishment of this means of communication and ravel, the village grew quickly. 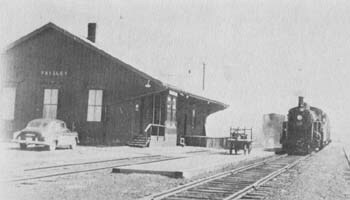 There is no record as to when the station itself was built or opened, but the Advocate of September 9, 1909, commented that “Paisley's old-time red station” had been repainted. At one time in its history, the building included living quarters for the station master and his family. The building extended to the south of the present structure, and an annex was attached to the east. The annex and a section at the south end were torn down many years ago. For many years, too, the platform fronting the building was elevated on stout cedar posts to the level of the station floor. In relatively recent years, the posts were removed and the platform lowered to track level; patrons then entered the station by a short flight of steps. 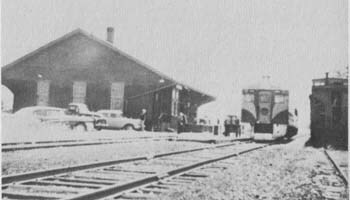 The station was closed Oct. 24, 1969. Some equipment and train order signals were removed soon afterwards, and tickets on the Dayliner were to be procured from the conductor or, if preferred, could be purchased by telephone from Palmerston on a charge account, if the purchaser was listed in the telephone directory. Passenger service was discontinued altogether November 1, 1970. 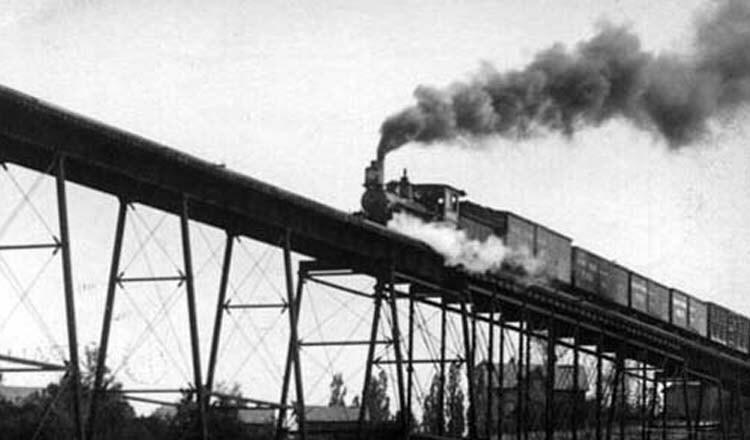 At one time there were two grain elevators, one to the north and one to the south of the station. These were torn down a number of years ago. Near the stock yards was another large building for storing grain. Several coal sheds along the east siding, south of the station, remained until the oil burning era. 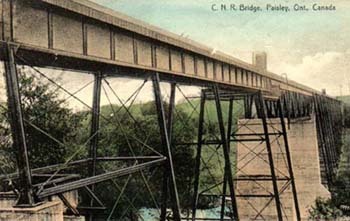 In the 1920's two massive concrete abutments were poured at the centre of the bridge and, in 1947, the second phase of the strengthening programme began. A third cement pier and a second huge steel span were added. The origznal iron framework was replaced by heavy timbers at the east end of the bridge.At the west end, fill was poured into the gorge, but the continual shifting of great masses of fill presented such a problem that a wooden pier was installed to give support to the west end. The bridge alterations were mainly completed in 1949, but as heavier freight is transported to Douglas Point, reinforcement of the bridge must keep pace. The structure is now 607 feet long. 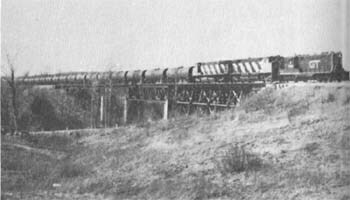 A sixty-car oil train powered by four diesel locomotives crosses the bridge at a speed hardly realized by a freight train on regular track in past years. Submitted by Mr. R.A. Ernst, Manager of Telecommunications at Landon. Recently I came across an old timetable for the Great Western Railway and some of the information may be of interests. 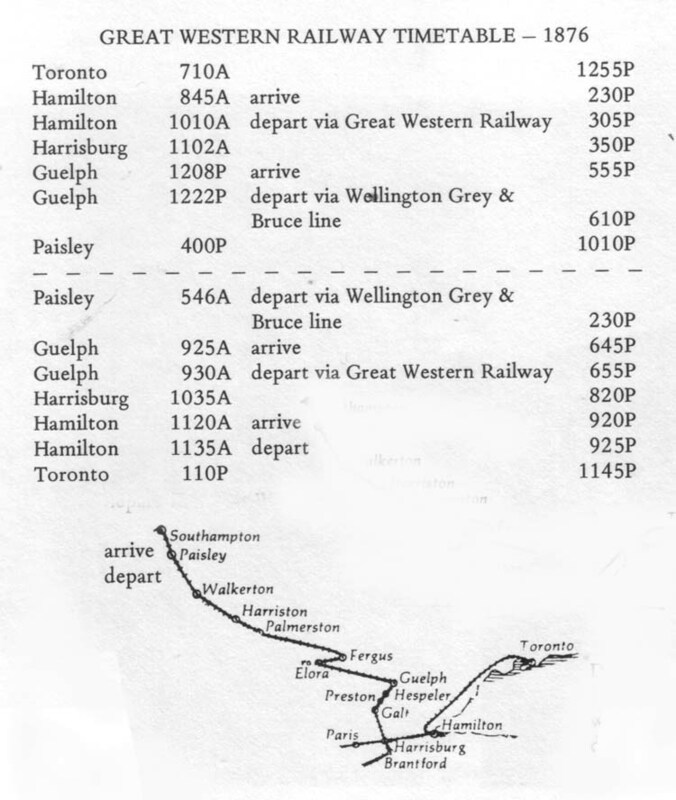 The trip from Toronto to Hamilton was via a Toronto railway service (the name of the railway is not shown), from Hamilton to Guelph via Great Western Railway and from Guelph to Paisley via Great Western Railway on the rails of :he Wellington Grey and Bruce Railway. Also mentioned in this timetable was :he fact that all trains operate on ‘Hamilton Ontario time'. The railway cars of :he Great West Railway at the time were painted canary yellow. In 1925 Mr. John S. Campbell bought the bus and dray business from Mr. Ed Dudgeon. Many “old Timers” will remember riding to or from the C.N.R. Station in this bus. Fare one way was only 25¢. 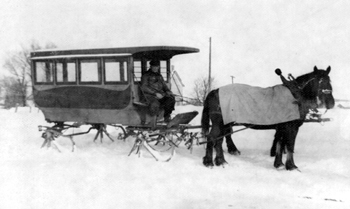 In winter the bus was equipped with runners and in summer the runners were replaced with wheels. Pictured driving the team is Mr. Offie McTeer who worked for Mr. Campbell for many years. The worst storm since 1918 stalled Thursday morning's train at the Christie farm, just this side of Turner's station, until Friday afternoon. 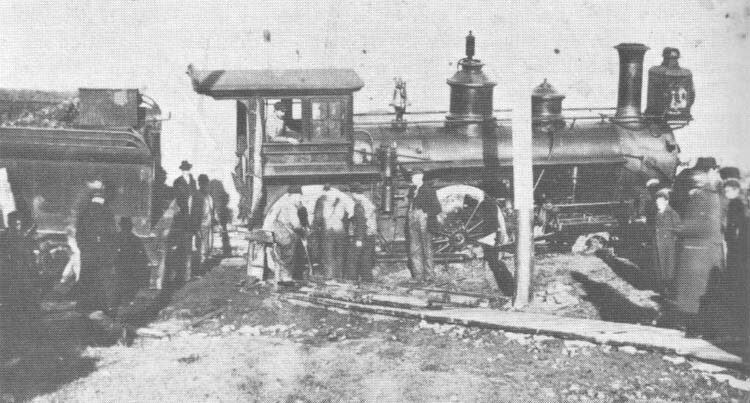 A crew of about 60 shovellers was picked up at points from Palmerston north and accompanied a snowplow to Turner's and was kept working night and day until the train was released. Mr. and Mrs. Adam Munro undertook the contract of boarding the passengers and workers. Mr. Munro has a general store a few rods from the station and besides having a quarter of beef, cured hams and potatoes, there was a stock of canned goods on the shelves. Boxes of bread were commandeered from the train and milk was brought from nearby farms. The eaters were served in relays. 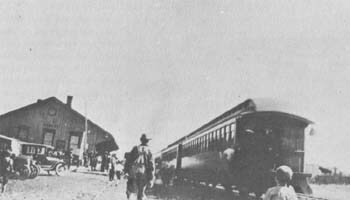 The passengers slept on the train, which moved out about noon, but ran into another impassable bank a couple of miles from Turner's and stood there until the shovel gang cleared the way. 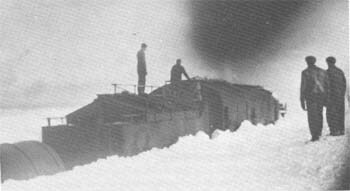 The storms continued and no trains from the south had been able to reach Paisley in over a week. As a result the Advocate was again able to produce only four pages of this issue. track near Turner's March 12, 1947. 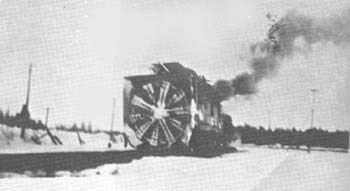 Rotary Snow Plow from Quebec to clear snow blocked tracks, March 1947.